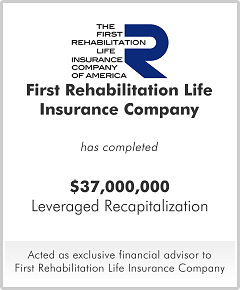 First Rehab provides disability insurance to over 100,000 business and 1,000,000 insured lives in New York. With earned premiums of approximately $100 million, First Rehab is the largest provider of statutory DBL insurance in New York. First Rehab engaged M&A Capital to assist in raising capital for both the growth prospects of the Company's business and for shareholder liquidity to diversify the shareholders' personal balance sheets. M&A Capital assisted the operations of the business by hiring a new management team, including Rich White – a senior executive from Guardian; development of new growth products; and serving the advisory board. After M&A Capital identified both interested financial sponsors and strategic buyers, the First Rehab board of directors selected Eos Partners due to its knowledge of the insurance industry and personality fit with the major shareholders. The Eos structure allowed the existing First Rehab shareholders to maintain approximately 50% of the fully diluted equity.